Today, my hubby and I wanted to share what we are thankful for and challenge you to do the same. There are the obvious things to be thankful for... family, friends, full bellies and a roof over our heads. We are not talking about that kinda stuff. We are talking about the little things that seem trivial in the grand scheme of things. Hope you find our "weird reasons" amusing if nothing else! We are thankful that we will not be changing diapers on Thanksgiving for the first time since 2009. Yes ladies and gentlemen, you might want to sell your Huggies stock- we are done with that mess! We are thankful for our two stinky dogs that bark too much. I do complain about them quite a bit and I get really annoyed when they bark every time a door shuts... but they are loved. Plus, they are a huge help when you have two kids dropping food on the floor. We are thankful for La Bamba Mexican Restaurant. It may have saved my sanity tonight. No one in our family will ever turn it down, it takes all of five minutes to get there and it is super cheap. It was a great break from cooking today and I really REALLY needed to get out of the kitchen. We are thankful for canned jellied cranberry sauce. After spending the day prepping for our Thanksgiving feast, I am glad that I have one "dish" that takes all of two minutes to prepare. Step 1: Open can. Step 2: Put on plate. Step 3: Cut along the ridges. Step 4: Fight family members over the quickly vanishing slices. If you haven't noticed, we are southern and hold our canned sauce in high regard. We are thankful that we, as a couple, have no interest in Black Friday shopping. None. Zilch. Nada. No way. You can find us at home- still in bed sleeping off more than our fair share of food. Speaking of our fair share of food, we are thankful that we are spending the night relaxing and catching up on the DVR with a pint of Ben and Jerry's. Nothing is better than pre-gaming with ice cream the night before the gluttonous undertaking which is Thanksgiving. We like to think that we are supporting each other's happiness... you may call it "enabling" if you like. 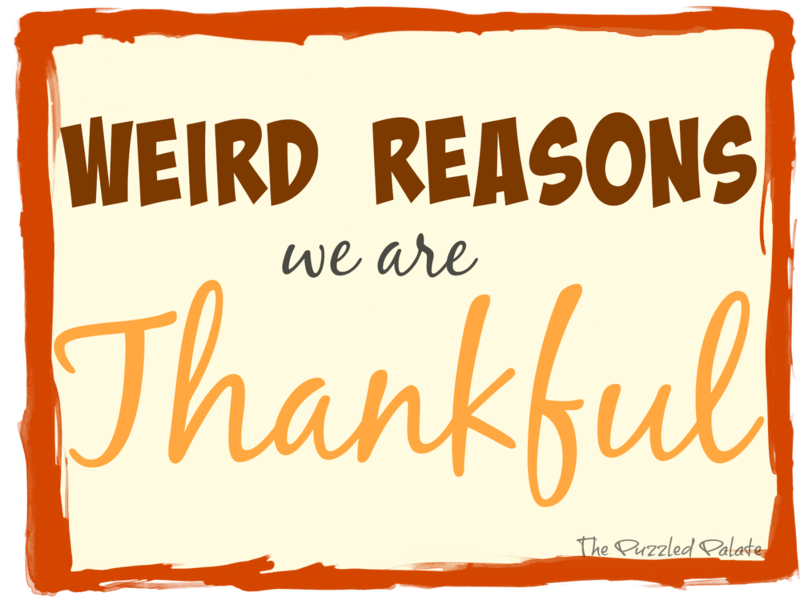 I'm with you sister on being thankful for weird things. I can't wait to join you with that diaper thing. Mmmmm, mexican food. Pass the tacos!